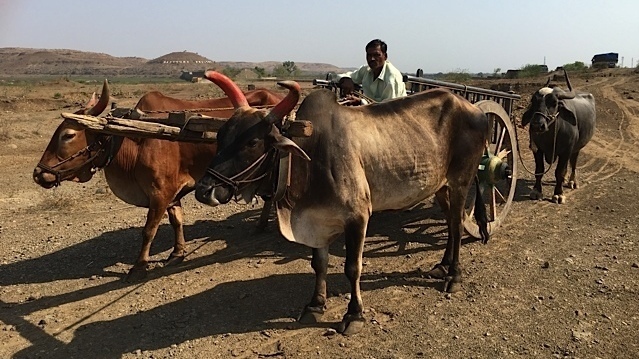 Amid India's Drought Crisis, Suicides Increase Among Farmers Deep In Debt In the parched fields of India's central states, the district of Beed in Maharashtra has been buffeted by a multi-year cycle of drought. One widow tells her story of coping with drought and loss. A farmer steers his cart through land that was a dam brimming with water just a few years ago which fed the district of Beed in the parched state of Maharashtra. After two years of drought it is among India's hardest-hit. Tukaram Jadhav was barely surviving off of his tiny cotton farm when he killed himself last September. His widow, a petite mother of two, pulls her purple sari tightly around her, and says she discovered her husband as he lay dying. "I was the one who found him. I was sleeping and woke up to the powerful smell of pesticides that we use to farm," Bhagyashree Jadhav says. She says she thought there had been a spill. "I asked my husband if he smelled it, then I realized he couldn't speak. He'd swallowed the pesticide." Tukaram languished in the hospital for two days before dying. Bhagyashree Jadhav was widowed after her husband took his own life last September. Overwhelmed by debt and dying crops on his tiny cotton farm, he swallowed pesticide. But his widow says, "I will never turn my back on life." She awaits the monsoons just weeks away "with hope." Bhagyashree is one of the new widows of Beed on farms in the western state of Maharashtra. 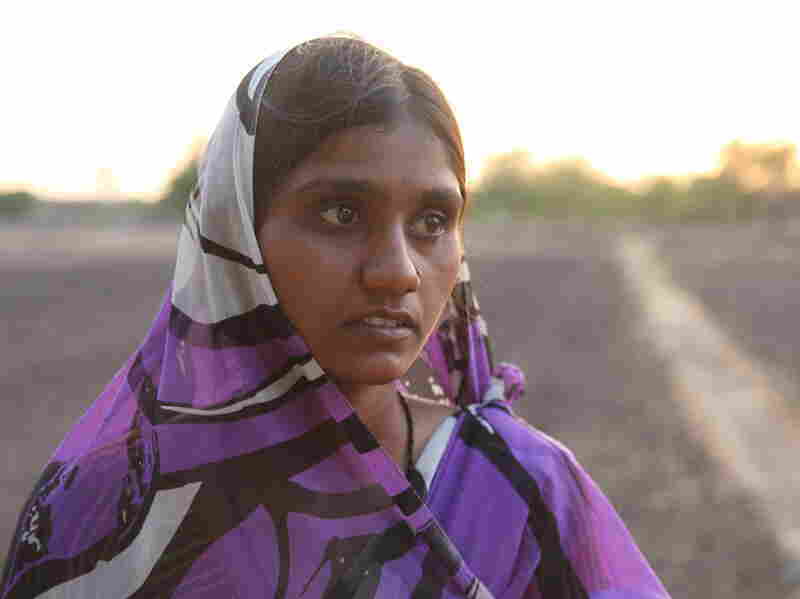 They face life with no water and usually no inheritance of their husband's land in this deeply conservative culture. In India, two consecutive years of weak monsoons have left some 330 million people — a quarter of the country — in the grip of drought. Deepening the crisis, farmers are taking their lives. Bhagyashree's brother-in-law, Dnyaneshwar Jadhav, says his brother Tukaram was distraught over loans he'd taken out to stay afloat in the face of his withered crops. Private money-lenders charged his brother usurious interest rates and pulled him under, Dnyaneshwar says. "He paid as much as 50 percent interest on his loans and he couldn't get out of the cycle or talk about it." Dnyaneshwar suspects his brother kept silent because he was too ashamed he'd fallen into distress a second time. The first time Dnyaneshwar had helped rescue him. Dnyaneshwar says the timing of his brother's suicide was "irony." Tukaram, just 35, poisoned himself on the same day Hindus honor Lakshmi, the goddess of wealth. "We'll never be able to celebrate it again," he says. Tukaram was one of 3,228 farmers who killed themselves in the state of Maharashtra last year. The state has been one of the hardest hit by the on-going drought in India. While the pace of suicides has slowed this year, farmers who feel anguished over debt and failed harvests continue to take their lives. Dnyaneshwar Jadhav, whose younger brother killed himself, stands in his fields and says in a bid to survive he switched from cultivating water-guzzling sugar cane to less water intensive cotton. But the farm well, 60 feet, is dry and the ground water levels have sunk to new lows. 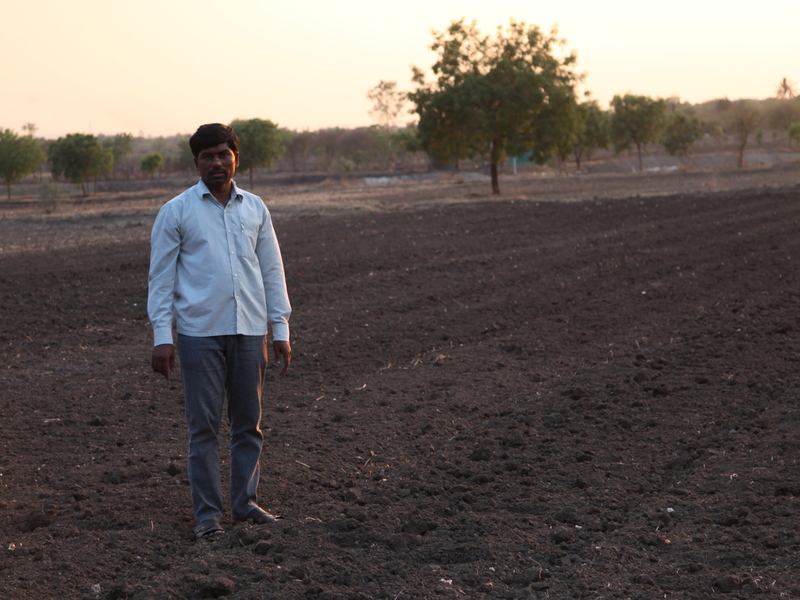 Dnyaneshwar stands at the foot of his small acreage beside the family's well — it's 60 feet deep and dry. "When I look into the well, I feel like dying. Life is such a struggle," he says. "We used to earn over $300 for our cotton, we now get less than $100 because the yield is so small." Before cotton, the Jadhavs grew sugar cane — a water-intensive crop that was lucrative for farmers and enriched powerful sugar mill owners. But the secretary of India's water resources ministry, Shashi Shekhar, says it was a wholly inappropriate crop in a region prone to drought. "That's a mistake. We have to learn from our mistake and change." Shekhar says horticulture crops like fruit, vegetables and nuts are even more profitable than sugar cane. Moving to such crops as guava or pomegranate raises the income of farmers "seven to 20 times vis-a-vis sugar cane. So you have to incentivize them," he says. The challenge is educating farmers, like the Jadhavs, to conserve water and grow crops better suited to the climate. Back at their farm, we sit with the family beneath a moonlit sky in their untilled cotton fields. The patriarch of the family, Ramkishan Jadhav, makes a painful admission that dramatizes the need for help. "I see the changes, I know they're there, there's no water," he says. "But I'm numb. I'm dumbstruck. I don't have a clue what to do." In the dark, he rises to fetch a torch. His daughter-in-law Bhagyashree, widow of his youngest son, is fortunate to have in-laws who embrace her. The Naam Foundation, a local NGO established to assist women widowed during this drought, is also funding the education of her son and daughter. But she's still fragile. When her father-in-law is safely out of earshot, she breaks down with a confession of her own. "My husband killed a part of me when he killed himself. It's as if we didn't exist," she says, tears flowing. "I will never turn my back on life," she says. "I choose life for my children." With the start of the monsoons just weeks away, the widows and farmers here in Maharashtra scour the skies with hope, and wait for the rains.